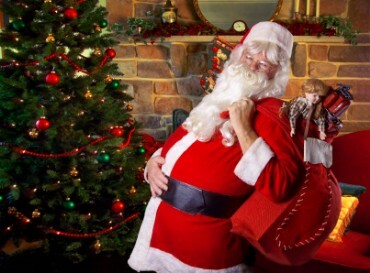 The image of a man with a beard and a big belly in red clothes carrying a large sack of gifts always brings smile on the faces of children around the world during Christmas. This man is popularly known as Santa Claus. He is also called Father Christmas, Saint Nicholas and Pere Noel. For people everywhere, Santa Claus is a symbol of a spirit of gift giving in Christmas. His has so strong association with gifts that most gift wrappers are colored red, this is like homage to his bright red colored suit. The question arises that why Santa wear red. The precise reason is not certain and there are a lot of stories but none is more credible than the story of Saint Nicholas of Myra. He was a fourth-century Christian bishop who was famous for inheriting a fortune and donating all his wealth away to the poor. This was the reason he eventually became the patron saint of children. Although Saint Nicholas was a pope, he had influenced the modern-day Santa Claus is depicted. The popes of olden times wore red robes and a red miter. Sinter Klaas, as he was popularly called in Dutch but he was not depicted as a laughing big-bellied bearded man during that time. He was a very compassionate saint whose religious duty was to teach the virtue of giving gifts. His Dutch name ‘Sinter Klaas’, was ultimately Anglicized into Santa Claus. The basics of the drawing of Santa Claus by artists and portrayed in movies comes from the 19th century poem written by Clement Clark Moore – The Night Before Christmas or A Visit From Saint Nicholas. He describes that Santa as a man who is dressed all in fur from his head to his toe and his clothes were all tarnished with ashes and soot. However the color of his suit was not specified. An artist named Thomas Nast first drew Santa in the way we see him today, it was based on Moore’s poem. George P. Webster made five of Nast’s drawings into colored lithographs. Santa was portrayed as an excessively fat, happy and a white-bearded elf wearing a spotted red-brown and skin-tight suit. The jacket’s base was trimmed with white fur which was lined with attachments. The poem identified North Pole as Santa’s home. It was thought that since Santa Claus lived in the North Pole, it is normal to expect him wearing warm clothes. People usually wear warm coats made from deerskin and fur in cold places. The legend says that Santa Claus met with a squire who was wearing an impressive suit of red deerskin trimmed with soft white ermine at cuffs, collar and at the bottom. Santa wanted a suit of same type but he was not rich like the squire. He asked the village’s seamstress to make the same type of suit for him. The seamstress used a bolt of strong woven cloth and dyed a rich red and white rabbit skin for the trimmings. However, the seamstress made a mistake of creating a suit for a larger man. That is why the earlier image of Saint Nick is of a slim man wearing a loose red colored coat held together by a belt around the waist. Santa had not always worn red before the 19th century. During the times of Celts and Saxons, a man called Father Christmas or Old Winter dressed in green used to visit homes for celebrating the midwinter solstice. Green was the color of spring and this man who wore it represented the welcoming spring. He was neither a bringer of gifts nor someone who came down a chimney. He used to simply go from one house to another for eating dinner with families. In Norse tradition, Santa wore a long blue hooded cloak. The Norse believed that Father Christmas was an Odin disguised in his winter form as a well-built elderly man with a white beard riding around the world on his eight-legged horse called Sleipnir at solstice. However, just like the modern Santa Claus, he also carried a bag of riches distributing to the poor or the worthy.